Yes, it's me. 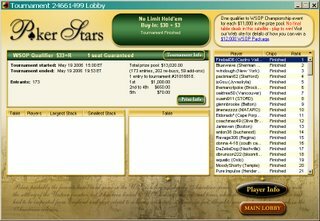 I won a $30 Pokerstars satellite tournament and beat out 172 other players to win a $10,000 entry fee to the World Series of Poker Main Event in Las Vegas starting on July 28th, 2006. 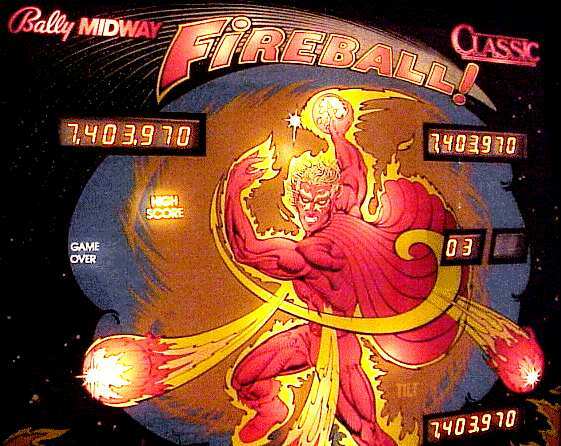 On www.pokerstars.com I am Fireball36. Here is the winning tournament final standing. It hasn't sunk in yet and I don't think it will until I get to Vegas and see all the other players. I told my brother and he said: "It's hard to believe, but then it's you, so I can believe it." here is what happened... if you want to play in the World Series of Poker Main Event, it's a $10,000 entry fee. So some people pay it directly. the big increase is from people like me. Last year they had about 5700 players, about 10% cashed and the first one to lose on final table got $1,000,000 and the big winner got $7.5 Million. 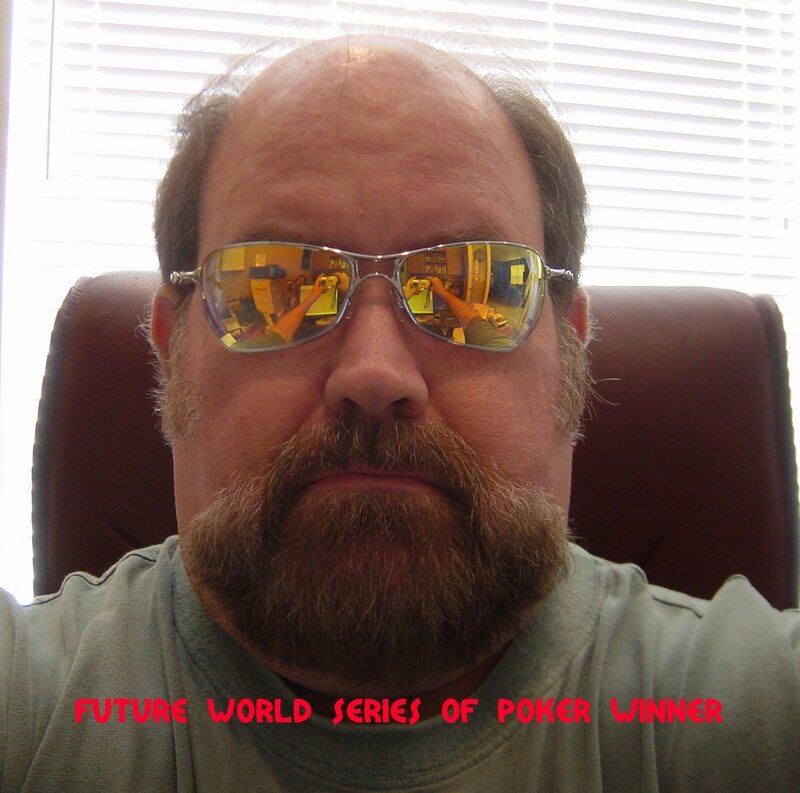 The online poker sites, like the one I play have satellite tournaments daily several months before the WSOP event and so do card rooms and casinos. 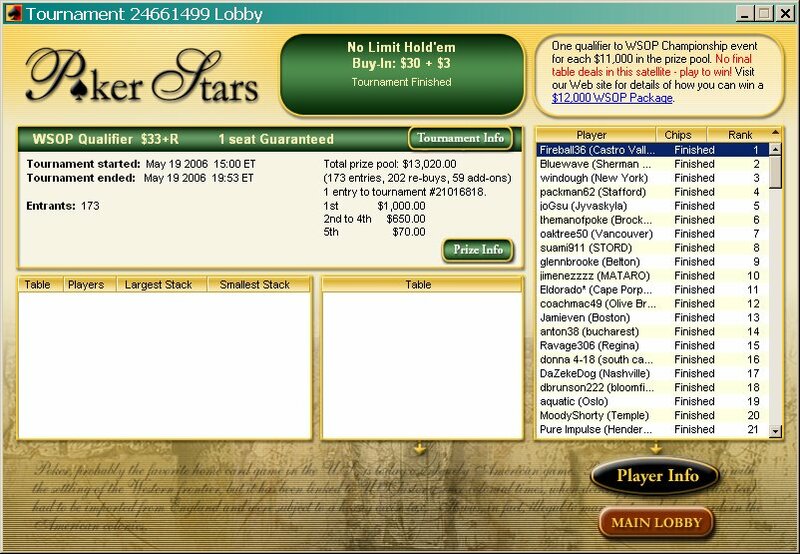 I played in a few earlier and didn't make it, but this time I played in a game that had 1 guaranteed entry - $10,000 entry fee, $1000 spending money & a free hotel room in Vegas for 9 days. it took 4 hours & 53 minutes to get to the final hand and I won beating 172 people. In Vegas it will be 12 hours a day for many days, so I've got to get into mental & physical shape. No Limit Texas Hold Em Poker takes a massive amount of patience, knowlege, observation, acting skill, & luck. Hopefully I will have enough of all that and a bag of chips, poker chips that is. I have confidence that I'm as good or better than 90% of the players, so I just need 10% luck. I knocked out Windough with 11 hands to go. She went all in for 86,692 chips with a K-3 offsuit and I had pocket Q's. I won with Q's & 10's to his 10's. I had 5-2 of diamonds and got check raised on the turn to 36,000 chips on a flop of 7h Qc Td and a turn card of 8d, but then I got 9d on the river which gave me a flush and also put a straight on the board. I don't think he thought I had a flush, but he was afraid I had a K and he probably already had a straight with a 9. I bet 96,000 and Bluewave folded, but he was crippled. Bluewave went all in with 9h Kd, I had 6h 6d and called his 170679 chips and the board ended up as Td 2d 7h Qs 6s, so I won with trip 6's. For those who don't know much about Texas Hold Em Poker, click here. Making the Creative Leap of Faith, Should I take the easy route? I have to figure out if I can make the leap from an easy job that pays really well into something that I will enjoy so much more and still keep up the income. it's really scary and always much easier to keep the status quo. I'm setting a deadline for myself of my birthday in October 2007. That will be about 1 year after the Inspirational Speaker class, so I should know by then if it's a viable option. Learn to design and deliver an inspiring message. Develop a new relationship with your voice and essential skills to step into your power and build rapport. Practice using stories, spontaneity and humor. See how to market yourself to get booked. Learn about producing and selling Back of the Room (BOR) products – a huge income potential. Even if you just want to be a better speaker, you should register for the class. Click here for the link. I'm also going to visit one of Marcia's seminar speakers - Renée Stephens and take her Say Goodbye to Food Compulsion session (Mind For Body). My plan is to be someone completely new by October 2007, so much so that some people won't recognize me. I've gone through big transitions before and sometimes it's just better to do a whole bunch at once. I'm in a non-creative rut that I need to break out of.